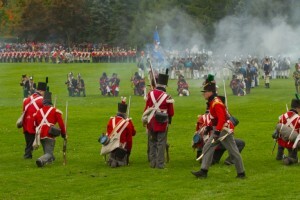 The War of 1812 was one of Canada’s most dramatic military engagements. Declared on June 11, 1812, the war waged between the Britain and America lasted nearly three years, and battles between the British military giants and their old enemies the Americans took place all over North America — including Niagara Falls. No fewer than seven distinct historic battles took place in the Niagara region, as it was such a significant center of agriculture, trade, and beauty that both armies wanted to claim the area as their own. The most famous of all battles waged in Canada was that of Lundy’s Lane, and it has earned its place in history for being one of the bloodiest and deadliest battles that has ever occurred within Canadian borders. In the summer of 1814, British and American forces crawled all over the surrounding Niagara landscape. An American army had just defeated the British at the Battle of Chippawa, and surrounding British armies were relocating southward toward the falls to give aid to their faltering comrades and prepare for retaliation against the Americans. The Americans and British had several hints about their enemies’ movements, as both armies reported sightings of scouts and messengers in unexpected regions; however, when a British sentry was nearly killed by the relocating American army, the drums of war began to sound. The sentry raced back to the main force to explain his findings. Meanwhile, the Americans were informed about the British force by a local tavern owner afraid for her livelihood. They learned that the British were currently camped at the base of a strategically significant hill at Lundy’s Lane. In the time it took the Americans to move toward the region, the small British army was bolstered by many reinforcement troops, and they remained confidently camped on Lundy’s Lane Hill. While most of Britain’s land forces were encamped on the hill, the Americans still vastly outnumbered them, and soon the British abandoned the hill and were on the verge of defeat. The battle carried long into the night and next day, and large numbers of soldiers were critically wounded and killed. Yet, the urgent need for supplies forced the Americans back to Chippewa, allowing the British to reinforce their troops and entrench themselves on Lundy’s Lane Hill. Despite several vigorous attempts by the Americans, they were never able to regain their position on top, and they withdrew to Fort Eerie, burning everything in their wake. History buffs and military fanatics love experiencing places of significance in defining historic wars — and Niagara Falls is just that. During your stay in Niagara Falls, you can learn more about the region’s experience during the War of 1812 by visiting the Niagara Falls History Museum. 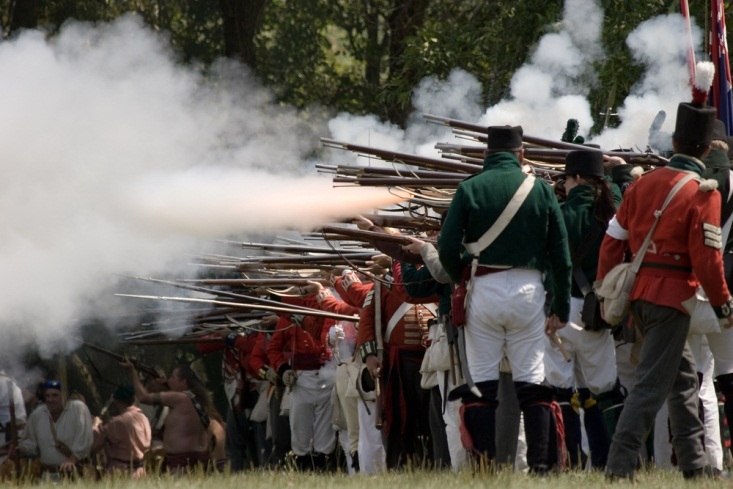 Inside, you’ll learn in-depth details about the war and participate in hands-on activities like wearing the British military uniform and handling a few period weapons. Just outside the museum, visitors can take a self-guided walking tour through the site of the Battle of Lundy’s Lane. The museum and battleground tour are pleasant and informative, and interested parties are sure to have a blast — figuratively, as all weaponry is currently non-functional.